A new decade dawns in less than three months (in most people’s eyes anyway). While an arbitrary landmark, it also coincides with (hopefully) a convincing end to this recession and a return to prosperity and growth … though not business as was usual. The new decade brings a new set of priorities and challenges for the food & beverage industry. From governmental/regulatory changes, which could come any day now, to more gradual (though certainly not glacial) changes in consumer buying habits, the one constant remains change. Food Processing asked its Editorial Advisory Board, contributors, readers and web site visitors what they foresaw as the biggest game-changers for 2010 and beyond. We got a wide diversity of opinion, but we managed to consolidate some and distill them down to the following eight. Several of them were written by regular contributors. If you think we missed some, let us know. E-mail the editor at dfusaro@putman.net with your thoughts. If we get enough, we’ll print the comments in our December issue. The Dietary Guidelines for Americans have been published every five years since 1980 by the Dept. of Health and Human Services (HHS) and the Dept. of Agriculture (USDA), and 2010 will see the new edition. They aim to provide authoritative advice about how good dietary habits can promote health and reduce risk for major chronic diseases, and they serve as the basis for federal food and nutrition education programs. First published in 1980, Dietary Guidelines have been revised every five years since (federal law requires their revision at least every five years). The 1995 guide focused much attention on the Food Guide Pyramid, devised three years earlier by USDA, with its wide base putting emphasis on grain products (6-11 servings of bread, cereals, rice, pasta) and a narrow tip that suggested using fats, oils and sweets sparingly. Another ’95 star was the year-old Nutrition Facts Label, which spelled out fat, calories and other nutritional components of food and for the first time told of serving sizes. The 2005 Dietary Guidelines repainted the pyramid with angled vertical bars instead of horizontal ones and suggested there was a need for some personalizing, hence the name MyPyramid. One of the widest bars called for lots of grains, especially whole grains. The manufacturing community responded with more whole grains, and consumers bought in. Vegetables got a wider stripe than fruits, and milk products held their own. Fats and oils got only a sliver. Maybe the biggest change was the little figure jogging up the side of the pyramid, suggesting considerably more physical activity than most Americans were getting. What the final 2010 guidelines say is anybody’s guess right now. Sodium has taken quite a beating in the court of public opinion, and many observers expect the daily limit to be lowered, possibly to about 1,500mg from the current 2,300mg. At the June Institute of Food Technologists’ Food Expo, Eric Hentges, a member of the Dietary Guidelines Advisory Committee, said solid fats, alcohol and added sugars are being scrutinized; prebiotics and probiotics are being heralded. The Dietary Guidelines Advisory Committee has been meeting since October 2008. The fourth and fifth expected meetings were not scheduled as of our press time, but the group needs to wrap things up early next year. By spring, the committee will issue its report to the secretaries of USDA and HHS, who will publish the initial report and make it available to the public for comment. Earl warns there sometimes are things the committee recommends that are not included in the final guidelines – such was the case with increased consumption of fish in the 2005 guidelines. Next summer, USDA and HHS will consider the committee’s scientific recommendations and public commentary in coming up with the Dietary Guidelines Policy Document. And in the fall, USDA and HHS are expected jointly to publish the final Dietary Guidelines for Americans (seventh edition). The following was contributed by Leslie Krasny, a partner in the San Francisco office of law firm Keller and Heckman LLP, and a longtime advisor to Food Processing. Food safety reform is a key government priority right now, with significant changes under consideration or being implemented. At the top of the list is overhauling the FDA. The House of Representatives passed comprehensive food safety legislation for FDA-regulated foods, the Food Safety Enhancement Act (H.R. 2749) on July 30. The Senate is expected to address the issue this fall, although the timing is unclear due to the current legislative focus on health care reform. One of the most important changes would be to give FDA, for the first time, the power to order recalls. Most consumers find it hard to believe the agenciesy responsible for food safety that protects them does not have the ability to recall dangerous items. The House bill also would require mandatory hazards analysis and critical control points (HACCP) plans, food safety and food defense plans, an FDA-mandated product tracing system, greater records access during inspections, increased frequency of inspections pursuant to a risk-based schedule (although there are no definitions of high and low risk facilities in the bill), and mandatory reporting, by high risk facilities, of finished product test results showing the presence of contaminants in food that pose a risk of severe adverse health consequences or death. How to fund all this new enforcement activity? The House proposal also includes an annual registration fee of $500 for each facility holding, processing, or manufacturing food (up to $175,000 per company) and fees for reinspection (if due to violations) and recalls. Issues in the Senate include concerns that some provisions of H.R. 2749 would be too burdensome for small farmers and processors. The Congressional Budget Office estimated that the user fees would generate $1.4 billion over the next five years, but that an additional $2 billion would be required to cover the costs of increased inspections. Although there have been suggestions to divide FDA into two agencies, one to oversee food safety and the other to regulate drugs and medical devices, the House bill did not address the structure of FDA. Reportable Food Registry (RFR): This FDA program became operational on Sept. 8 but will not see full enforcement until the new year. The program requires “responsible parties” to inform FDA within 24 hours, by an electronic portal, if there is a reasonable probability that a food will cause severe health problems or death to a person or animal. There is an exemption from reporting, however, if the adulteration originated with the responsible party and that party corrected the adulteration or destroyed the food prior to it being shipped. FDA takes the position that otherwise reportable food transferred only within a “vertically integrated company” may be eligible for the exemption. But once food is transferred outside the company, such as to a third party warehouse, the exemption is not applicable even if title to the food has not passed. The law provides that the filing of a report is not considered “an admission that the food involved is adulterated or caused or contributed to a death, serious injury or illness.” Responsible parties are required to maintain records of reports and notifications for two years. Reports will not be publicly available but are subject to Freedom of Information Act (FOIA) requests, with redactions for confidential information. The statutory purpose of the RFR was “to provide a reliable mechanism to track patterns of adulteration in food in order to support efforts by FDA to target limited inspection resources to protect the public health.” FDA posted a detailed manual for completing the RFR report and also set up a help desk to assist companies in filing reports. During the first three months, FDA plans to exercise enforcement discretion. Safer produce and eggs: On July 31, FDA published three draft guidances that are intended to help minimize or eliminate microbial contamination in tomatoes, leafy greens and melons. FDA’s goal is to finalize these guidances as soon as possible after public comment, and to issue regulations within two years after that. The new draft guidances are consistent with, and supplement, past guidances for fresh and fresh-cut produce items. 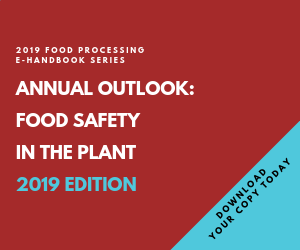 FDA has stated that the draft guidances represent a shift in regulatory strategy, from a primarily reactive food safety system to one focused on preventing foodborne hazards. What kind of store will be selling your products in the next decade? Just 20 years ago, nearly 90 percent of Americans’ at-home food purchases were made in traditional grocery stores. Today, their share has dropped to 69 percent. The biggest food retailers in the country? Walmart’s No.1 and Costco Wholesale Corp. is No. 3 (“traditional” grocer Kroger remains in between), according to Supermarket News. 7-Eleven is No. 11 and Dollar General is No. 19. Target’s coming on strong. Not only is Walmart No. 1 in food, but food is No. 1 in Walmart. Grocery is far and away the largest category for the giant retailer, accounting for 49 percent of revenue in 2008, up two percentage points from the previous year. That’s nearly four times the next closest category (entertainment at 13 percent). So Walmart is not giving up on food sales any time soon. Nontraditional food stores have managed to grab market share by enticing consumers with a formula of one-stop shopping and lower prices. They’ve introduced a whole new lexicon into food retailing – words like supercenters, hypermarkets, club stores, dollar stores, limited-assortment stores. Consumers don’t seem to be confused; they know where to find what they need. Overall, however, the grocery store remains king. Supermarkets are chosen by 44 percent of food shoppers “almost every time” and “fairly often” by another 31 percent, according to data from the Food Marketing Institute. Supercenters are a distant second, chosen “almost every time” by 18 percent and “fairly often” by 21 percent of shoppers. The following was contributed by James Rice, vice president and China country manager for Tyson Foods Inc., and a longtime member of Food Processing’s editorial advisory board. Quality challenges and the global recession have slowed food, ingredient and agricultural trade between the U.S. and China, but the long-term connection between these two countries is undeniable. Right now, the U.S.-China bilateral relationship is the most important of all, and last year’s challenges will be viewed as a pothole in a rising road. Since 2000, U.S. exports to China have grown 341 percent and China has been the fastest growing export market for U.S. products. China already is the third largest U.S. export market, worth $70 billion. In the coming decade, China will represent more than half of the world’s gross domestic product growth and half of the world’s growth in protein consumption. China also will grow in its role as a major supplier to the U.S. and as a consumer of American products. This momentum should not be lost by American food processors. What is needed is a collaborative relationship between the U.S. and China to ensure market access and a level playing field for all companies. The Obama Administration will continue with two important cabinet-level forums that work with the Chinese leadership: the Joint Committee on Commerce and Trade, which handles specific company trade issues, and the Strategic and Economic Dialogue (S&ED), which serves as a forum to discuss long-term strategic issues and to prioritize the agenda between the two countries. It is the highest official dialogue between China and the U.S. One result of the S&ED was an agreement to establish the U.S. Food & Drug Administration’s first overseas offices in Beijing, Shanghai and Guangzhou. But the U.S. government will need to do more. Our industries will need more technical exchanges between American and Chinese regulators, so Chinese regulators can understand our processes. This is critical because China is just now developing standards for its own industries. Local standards that are unique to China create an entry barrier to companies that follow international standards. Another challenge is that U.S. industry organizations generally create their own standards, and these organizations are not equipped to promote American standards globally. The European Union is much more organized at promoting its standards to Chinese regulators. Adoption of EU standards in China often excludes U.S. products, which is part of the reason 40 percent of Chinese imports come from the European Union and not the U.S.
American businesses need the U.S. government to push China on market access issues. This highly political work cannot be done by individual companies or industry organizations. Billions of export dollars are on the line as the American producers are still waiting for permission to export food and agriculture products, such as beef, potatoes, strawberries and food additives. While large companies often have the resources and experience to expand into new foreign markets, small and medium size companies rarely do. The U.S. government needs a comprehensive plan to help support these companies’ expansion into the China market. Competitor nations such as the European Union, Japan, Australia, and Canada work hard to support small exporters, while the U.S. spends one-sixth the international average on export promotion programs. On the Chinese side, there is more work to be done to ensure its products have the quality and safety needed to be sold in the U.S. Clearly, China has the aspiration to address its quality issues and started with the publication of the new Food Safety Law. Implementing regulations need to be published by multiple ministries and agencies, so businesses can understand what needs to be done. Historically, China has not been transparent in the formulation and implementation of regulations. It would be better if this process were open to public comment, particularly by businesses that will be affected. Down the road, the Chinese government will have to show us in earnest these tough, new regulations will be applied across the board and without exception to all manufacturers in China. That’s the only way the “Made in China” label can stand with any confidence. While environmentalism has been around since the 1960s or ‘70s, and arguably before then, the green movement became a lot more urgent with the 2006 documentary “An Inconvenient Truth” and the efforts of former Vice President Al Gore. While even experts argue about global warming, no one can argue that business took notice of the need to save the Earth, parlaying the effort into good corporate PR, the marketing of products and even some operational cost savings. Walmart’s been a driving force, first requiring its suppliers to complete a packaging scorecard in 2008 and, in July of this year, announcing a similar effort for overall sustainability (the first supplier deadline for which was Oct. 1). Walmart does a good job of defining the multifaceted effort, dividing its new initiative into four general areas: energy and climate; material efficiency; natural resources; and people and community. All of those concerns are starting to coalesce under term such as “ethical” manufacturing or in corporate responsibility reports. While the movement may have slowed somewhat during the recession, it looks poised to come back strong with a pickup in the economy. Many food & beverage companies have executives with “sustainable development” or “corporate responsibility” in their titles. And consumers, at least in surveys, keep saying they will choose an “ethical” product over another … it just depends on whether their priorities are global warming, fair trade or minimal ingredients … and if their discretionary spending comes back. Consumers want foods & beverages grown, processed and packaged in an environmentally friendly manner; that are genuinely nutritional; that do not contain anything harmful, neither questionable ingredients nor contaminants resulting from shoddy manufacturing practices. The quest is somewhat quixotic, but Riley has started from ground zero before. As a corporate chef, in 1996 he started the Research Chefs Assn., to bring identity and respect to those chefs who toiled in the world of food manufacturing, not in Zagat Survey restaurants. “EFMA’s mission statement is twofold: To help companies learn to produce foods that are healthy for the consumer, healthy for the planet and healthy for the manufacturer’s bottom line, and to provide marketing support for its members,” Riley says. Hirshberg was building a successful and ethical yogurt company in Londonderry, N.H., even before Groupe Danone bought an 85 percent interest. The capital infusion has only allowed him to invest more in ecologically responsible manufacturing, travel the world delivering his message and directly affect the operations of a $21 billion global company. In the book and in speeches, Hirshberg tells of environmental projects at Stonyfield that also had quantifiable paybacks. Riley’s initial goal is to create a forum where food & beverage manufacturers can reach consensus on ethical manufacturing issues, ideally spanning that wide spectrum of ecology, nutrition and safety. He wants to involve consumer groups in the process for buy-in and proof of the sincerity of the food processors’ actions. Secondarily, he hopes his association can foster the development of more ecological manufacturing with best practices, good research and marketing support. His ultimate goal is a singular seal, ideally a singular score, on each package that represents the food & beverage processor’s commitment on all those points. “This seal on the package will represent the industry’s only consistent measure of a good’s ecological worthiness,” he says. It could/should be a powerful decision-making force for shoppers. Riley needs board members right now to help define the organization’s scope and purpose. To join his effort, call him at 417-581-0738 or by email at ecofma@gmail.com or visit www.ecofma.com. It is no secret people are going to the grocery store looking to spend less. Price and value have become key, which has driven many consumers to private label offerings for the first time. Intense price competition coupled with the fact private label SKUs are becoming more and more profitable have driven many retailers to reduce the number of SKUs in virtually every product category. A grocery store executive we recently talked to used tea as an example. The store has plans to dramatically reduce the number of brands of tea it carries from nearly 20 to approximately five. This movement, often referred to as “SKU rationalization,” lowers carrying costs for retailers, reduces the likelihood of stock shortages and provides retailers with an enhanced ability to squeeze their vendors. After all, fewer SKUs means less inventory and lower carrying costs. Time to focus on fewer vendors creates intense competition for suppliers. Couple all of this with the rising perception in quality of the private label, and it becomes abundantly clear private label is here to stay as a major part of most every retailer’s product offerings. The economy will recover and people will, of course, gravitate back toward some level of discretionary spending on specialty products and brands. However, the severity of the recession will likely have a lasting impact on how consumers view their weekly trip to the grocery store. Lessons learned with respect to price and value (the fact consumers have discovered they actually can obtain value at reasonable prices with private labels) will no doubt stay with consumers. As a result, the general consensus is people will continue to want more private label, which means it will continue to grow. That does all of this mean for food & beverage companies? Quite simply, there will be little room for slow-growth brands and non-strategic categories; rather, private labelers, contract manufacturers and even retailers will have to undertake a more aggressive and novel product development than they have in the past. Low-cost “me too” products will not be as viable as in the past, since shelf space will likely be at a premium and retailers will carry fewer SKUs than in recent years. All of this bodes well for larger national brands as shelf space is typically given to the No. 1 and No. 2 brands within a product category; the retailer’s private label will inch its way into the No. 3 spot. Though all of this may seem to create dim prospects for smaller brands and emerging food & beverage companies, this is not the case at all. Not only are there increased opportunities to partner with retailers in the production of private label products, but there will also be significant opportunities to innovate and provide value in product offerings. And although it is more limited than before, shelf space will be available to accommodate the most innovative products. Ultimately, the winners will be those who create new and unique products that capitalize on emerging trends important to consumers, and not those who simply copy the latest successful product. It will be more important than ever for middle market companies to regain access to credit when the credit markets recover to keep up with product development. Emerging and middle-market companies will have to focus on streamlining operations, as learning to operate more efficiently will be paramount to their success. Inevitably, changes in the way banks lend and investors invest will likely put a strain on capital expenditures, which will cause a significant resumption of large companies buying smaller, more innovative companies. After all, every emerging company wants to be the next Vitamin Water. Audit and advisory firm KPMG provides this whimsical look even further out, at the consumer and the company of the decade after next. The Instavidual – Crossover customers will jump segments. They may seek Armani style for their wardrobe but private-label pricing for their pantry. Consumer as CEO – Consumers will demand more integrity, accountability, information and control, and they will get it. Authentic Marketing – Information ubiquity means that when it comes to branding, the “truth will out. Taggable Universe – RFID, GPS and related technologies will be affixed to just about everything a consumer touches. Circles of Trust – What used to be held in close institutional control will be influenced by outside audiences as innovation, marketing, communication, and other practices take advantage of the role social networking and other new media can play in shaping and informing product development. Glocalism” – Connected consumers want what’s good for them to be what’s good for the world too, so long as it’s convenient and fits into their active lifestyle. Fungible Future – Social currencies, such as influence on the blogosphere, become an additional source of value. Pocket Shopping – Smart phones, ubiquitous WiFi, and mobile banking provide consumers with one-to-one product interaction allowing them to scan a product (in store, on the street, over the radio, etc. ), trial, and purchase it at the touch of a button. Traditional customer segmentation strategies will change dramatically. Companies will be engaged in Total Customer Experience management. Customer cocreation will become an embedded way of doing business, not just as a means of offering feedback on product development, but on a wider array of strategic business practices. Brands that do not “walk the walk” will be penalized, while product marketing that is open, honest, and credible will resonate. Tags will reveal everything from the freshness of storebought broccoli, to inventory holdings at each pickup and distribution point along the company’s supply chain. And that’s just the beginning. Those systems that inform a company and its operations will be open to outside voices; while that which distinguishes it uniquely will remain proprietary. Innovation practices will be disaggregated, funneling layers of problem-solving and testing to outside groups while cultivating other pockets of excellence in more formal in-house and virtual networks. Companies will fuse their sustainability practices into their business ones, coupling locally made and sustainable products with the advantages of global sourcing and procurement. Alternative currencies, such as loyalty and reward programs, will become increasingly integrated into social media. Recognizing that the medium is the message, companies will derive a whole new communication style to entice, retain, and satisfy pocket shoppers—offering everything from detailed product information to coupons to customer references.